Your family depends highly on a home central heating system to provide adequate heat to warm the rooms and provide hot water in your household, especially when the winter temperatures drop to the lowest unbearable levels. It is therefore the role of every private homeowners and landlords to ensure that a reliable central heating adequate for your specific heating requirements has been installed. Central heating installations should be carried out by a qualified and certified gas and heating professional to ensure proper installation and to avoid installation mistakes which could lead to future inconveniences. Eco Efficient Plymouth has over fifteen years’ experience in installation of varied central heating options for property owners in Plymouth including every corner of Launceston, Torquay, Saltash, Tavistock and Exeter. Our installation technicians are fully trained and licensed technicians who work together as a team to deliver quick and quality services at any given time. 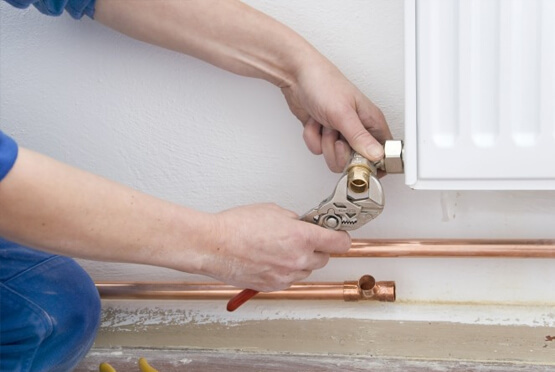 To ensure that your central heating is correctly working even after a heavy workload over the winter, you need to make the right choice during installation, repairs and maintenance. Your choice will also impact on the running cost. Our engineers will work with you at every step of installation and provide helpful guidelines to help you make quick, quality and economical selections at no obligation. What Do I Consider During Central Heating Installation? Home Heating Requirements – Whether you want a fresh or replacement installation, you need to know your specific heating needs – the amount of heat needed to keep your home water and heat up water for everyone in the household. Your heating needs depends on the size of your home, number of rooms and radiators, your home need for hot water, insulation and ventilation of the rooms. Our experts will help you with free requirement assessment, which will guide you central heating choice in terms of the size and type. Energy Availability – If your home is close to a main gas supply network, it is economical to use a gas-fuelled system. Choose between modern efficient electric or gas heating system based on the price and availability of each in your locality. Cost and Energy Efficiency – When buying a new boiler for your home central heating, you should go for modern models with a higher performance and efficiency offered at the best prices. A higher efficiency boiler will also reduce your monthly energy costs. Our central heating Plymouth experts will help you to get the best deal on energy-efficient and environmental friendly boilers from local dealers. Installers–If you want highly qualified and creative central heating designers and installers, Eco Efficient should be your choice. Our central heating installation installers offer more than quality services but also other free helpful tips. Our installers charge reasonable installation fees and will always engage you throughout the installation process. Eco Efficient installation technicians are also polite and friendly and are preferred for their excellent customer service in the region.